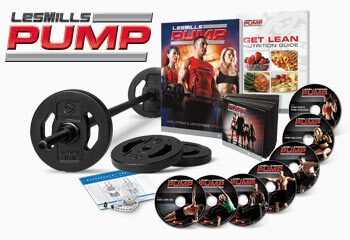 The Les Mills Pump is a barbell-based rapid weight loss and accelerated strength-training program. Its purpose is to help you reshape your entire body by employing the use of differently sized weights at higher repetitions. The international fitness sensation Les Mills has announced that it is teaming up with Beachbody to release their work out on DVD format. What does this mean for you? That now the workouts that have revolutionized fitness in gyms across the world, that have helped millions in Sydney, Shanghai, London and New York get into the best shape of their lives will now be available to you at home. Beachbody, the famed creators of such incredible workouts as P90X and Insanity Workout are going to bring this fantastic combination of workouts to your home, allowing you to get into peak physical condition regardless of whether you have access to an exclusive gym or not. With its eclectic mix of high energy workouts ranging from cardio to muscle building and beyond, Les Mills is guaranteed to change your life, your body, and your mind for the better. The LesMills workouts are varied and intense. BodyAttack is one of the core programs, featuring sports-inspired cardio work that will push you harder than you’ve ever gone before. Coming in just under an hour at 55 minutes, this high intensity workout will improve your agility, coordination, strength and endurance while working on the power of your heart and lungs. BodyFlow: is the yoga, tai chi, and pilates part of the workout, which will push your body to lengthen, grow supple and strong in ways you can’t even begin to imagine. Coming in at fifty five minutes, it will challenge your body to improve joint, flexibility and motion, while toning and shaping your muscles as it enhances mental wellbeing. BodyCombat: will take your cardio to a whole new level with aggressive, high energy combat inspired routines. In only fifty five minutes you will tone and shape your muscles, improve your strength and endurance and build incredible self-confidence as you practice a variety of moves inspired by taekwondo, muay thai, tai chi and karate. Strike, punch, and power your way through endless moves while burning calories! To complement BodyAttack is Les Mills’ BodyJam, a fun, grooving workout that will have you sweating up a storm to incredible beats. Of moderate intensity and focused on dance, this workout will help you burn calories, tone and sharpen your muscular definition while developing your dance moves and improving your balance and coordination. It’s not all cardio and stretching, however. BodyPump is the original barbell program that will challenge you to pick up some weights and build some serious strength and definition. Coming in at a full hour, this program will torch calories, improve your coordination as it focuses on strength and making you look insanely good. Through a combination of high rep and low weight loads anybody and everybody will be challenged to get in shape. Those are just a few of the classes that Beachbody is planning to release with Les Mills, but even this small sample should be enough to help you get revved up and thrilled to participate in this international phenomenon when it hits the US!